Manifesting as a “fresh and zesty yellow-green shade that evokes the first days of spring”, Greenery envelops the notion to breathe, reinvigorate and appreciate the great outdoors. You can see how it could be used in Pantone's promo video (below). For the past 16 years, Pantone has released a colour that embodies deeper societal trends, forecasting and influencing visual and design trends for the year ahead in homewares, fashion and industrial design to name a few. Greenery was already mentioned in Pantone’s top 10 colours for the fashion world in Spring 2017, released back in September. To arrive at the decision, Pantone colour experts look for new influences in areas such as entertainment, new artist, fashion, design, popular travel destinations as well as lifestyle and socio-economic conditions. Pantone choose a combination of Serenity and Rose Quartz colours for 2016, expressing need for harmony and peace in a chaotic world. Although mindfulness was indeed a key trend this year (such as adult colouring books and exercise) there’s also been undeniable political turmoil. Brexit and Donald Trump’s election have left Western society craving authenticity and a return to simplicity. We’ve seen the rise in appreciation for craftsmanship and recycling of natural resources within design disciplines. Take Adidas’s upcycled ocean plastic running shoes, the recycled paper “Eco Helmet” and brands choosing to return to retro logos as some examples. But this can also take place in an organic sense – such as the popular green superfoods like kale, seaweed smashed avocado - which took over every hipster café menu for a while. Greenery symbolises the importance and beauty within natural aesthetics and society’s pursuit of this. Our craving to escape modern society to explore the outdoors couldn’t be more evident than within an Instagram feed. “The tangy yellow-green speaks to our desire to express, explore, experiment and reinvent, imparting a sense of buoyancy,” said Leatrice. But on a more serious note, green also represents current efforts to tackle greenhouse gas emissions, with 195 countries The Paris Agreement to tackle this from the year 2020. 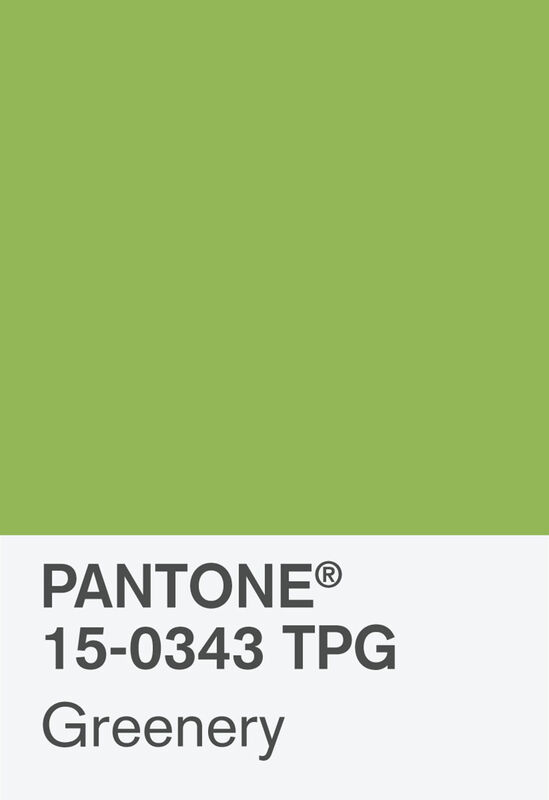 Pantone further breaks down areas in which Greenery will be evident for 2017. As well as representing environmentalism and nature, Green has also been a bold colour used for digital start-up companies and iconography, giving the colour an entrepreneurial essence. Pantone are forecasting Greenery to also be used in fashion – providing a pop of colour in accessories and shoes, or as a bold accent in pattern. It’s been seen in recent collections of Kenzo, Michael Kors, Zac Posen and Cynthia Rowley. Pot plants, herbs and spices, botanic-themed wallpaper and paint – bringing the outside, inside, is the theme for 2017. Plant life can reduce anxiety and improve self-esteem, give you a sense of satisfaction and achievement for looking after a living organism, or at the very least give you some fresh and tasty flavours to put in your meals. Used for packaging, Greenery represents freshness and youth – both attractive traits of any business.